KIEV, Ukraine -- Washington's UN envoy accused Russia of spinning "outright lies" on Ukraine designed to hide the Kremlin's direct involvement in a war it launched to thwart Kiev's pro-Western drive. 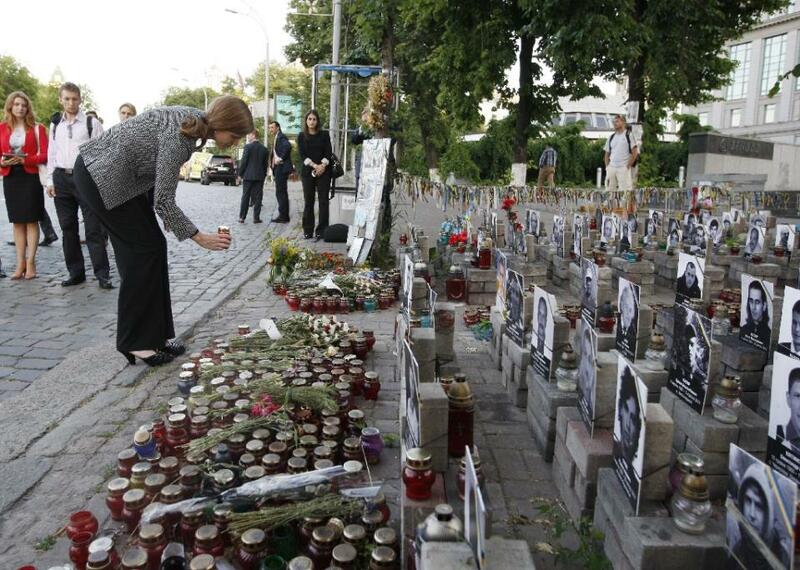 US Ambassador to the United Nations Samantha Power sets a candle at the memorial for Heavenly Hundred, the Ukrainian demonstrators killed during the protests in Maidan square, in Kiev on June 10, 2015. Samantha Power's address to a crowd of hundreds in Kiev delivered one of Washington's toughest messages to Moscow since the warring sides grudgingly signed off on a loosely defined truce in February that threatened to collapse last week. Her emotional 70-minute speech also came a year into a presidency Petro Poroshenko has used to try to wipe out decades of crippling corruption and anaemic economic growth that left Ukraine reliant on Russian help. Power said Russia launched the war in Ukraine's vital eastern industrial heartland 14 months ago in order to drain the new government's remaining financial resources and undermine its public support. She charged that the Kremlin then tried to disguise its agenda through a torrent of media propaganda and disingenuous speeches at global venues such as the United Nations Security Council -- messages that helped President Vladimir Putin's domestic support touch record highs. "The focus on Ukraine in the Security Council is important because it gives me the chance -- on behalf of the United States -- to lay out the mounting evidence of Russia's aggression, its obfuscation, and its outright lies," said Power. Putin has resolutely denied sending special forces into Ukraine's battle-scarred Donetsk and Lugansk provinces -- a predominantly Russian-speaking region with ancient cultural links to Moscow. The Kremlin strongman has called armed Russians discovered in the war zone "volunteers" and patriotic off-duty soldiers who were answering "a call of the heart". That message has been rejected by Washington and its EU allies. Leaders of the G7 group of the world's richest nations threatened on Monday to toughen their economic sanctions on Russia should the bloodshed grow any worse. But Moscow had viewed a rare meeting between Putin and US Secretary of State John Kerry -- held in what both sides described as a constructive atmosphere last month -- as a sign of the West gradually softening its tone. Power's public appearance worked in part to dispel that speculation and reassure increasingly-disenchanted Ukrainians that Washington remained firmly on their side. "You are still living in the revolution, and delivering on its promise will require all the resilience, smarts and compassion you've got," said Power. "And that was before Russian troops occupied Crimea (in March 2014) -- something the Kremlin denied at the time, but has since admitted, and before Russia began training, arming, bankrolling, and fighting alongside its so-called separatist proxies in eastern Ukraine, something the Kremlin continues to deny," Power added. "The Ukrainian people -– stay engaged in the reform process," she urged. Last week's fighting -- which was along the twisting line splitting the rebel-overseen region of around four million from the rest of Ukraine -- killed more than 30 people and rattled the nerves of EU powers Germany and France. The two countries were instrumental in forging the so-called Minsk Agreements that aimed to finally settle one of Europe's most destabilising conflicts in decades. But a quiet spell at the start of the week was followed by a new day of fighting that officials from both sides said claimed the lives of two soldiers and four civilians. The United Nations estimates that the entire campaign has killed nearly 6,500 people and driven more than a million from their homes. But Ukrainians' frustration with seemingly ceaseless warfare has been compounded by a growing list of economic problems that have left Ukraine's state coffers barren and the lives of many much worse off than they had been in years past. Kiev has warned that its inability to win any relief from its private lenders may force it to stop servicing its outstanding debt payments as early as next week. Such a decision would push Ukraine into a technical default and make its return to sustainable growth even more complex. Ukraine's main private creditors warned on Thursday that they were "deeply concerned" by Kiev's current debt negotiating position. It "is not in the interests of Ukraine," they said in a joint statement. The International Monetary Fund has said, however, that it could continue to support Ukraine with bailout funding even if Kiev does not reach a debt restructuring deal with private creditors.